The OBEY X LEVI’S® Project – 10/29 Times Square Live Installation Event and Collaboration Release! Directly after the live installation at 7pm, Shepard will have a signing of the LEVIS Collaboration Graphics and the punk PIONEER posters. 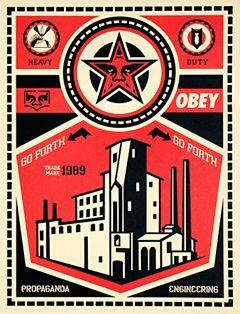 The poster suite consists 4, 18×24 inch, posters with front and back printing – using LEVIS infused graphics of the OBEY FACTORY, PROPAGANDA ENGINEERING, STAY UP GIRL, and OBEY EYE. All 4 posters form one large punk PIONEER poster measuring 36×48 inches. The event is Free and open to the public – see you there!